As previously posted here about the “Bolton by-pass” – Bolton Arterial Road System (B.A.R. 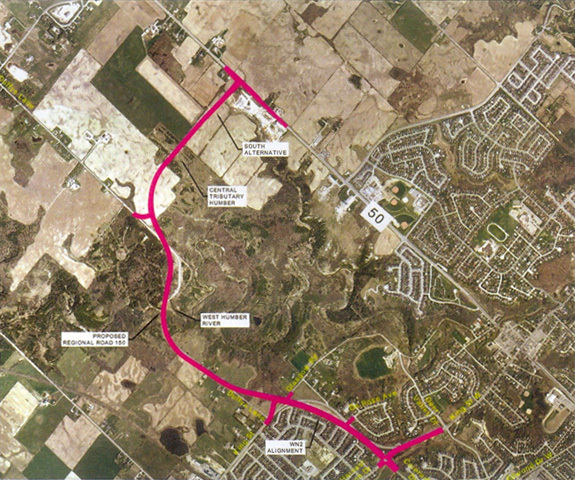 ), I have a new update on the status of the project from Richard Whitehead, Regional Councillor for Caledon’s Ward 3 & 4 who was kind enough again to fill us in about how the project is progressing. Below is his update on the project. Could you advise where you obtained the aerial mapping included in this article? It was included in a mailed newsletter from Richard Whitehead, Regional Councillor for Caledon’s Ward 3 & 4. The B.A.R. has generated much conversation at the local coffee shops. The comments from many local truckers is that the traffic circles are too small for the size of trucks (52′ +) which will be using it. The truckers are suggesting that they will need both lanes in order to circumvent the corners. Too Small Traffic Circles will make havoc for both the East/West Coleraine / King street commuters and the north/south Highway 50 circle. Take a look at the size of the circle on Hwy 50 and make your own judgement! !